Cast your vote online or by phone. 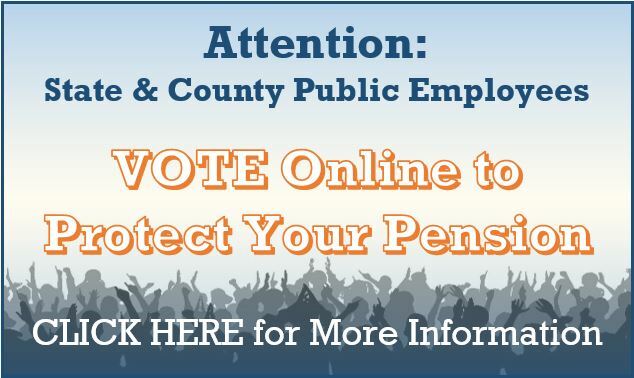 Please keep in mind that only active employees (not retirees) that are enrolled in the PERS retirement system can vote in this election. If you are a municipal employee, you cannot vote in this year’s election. If you are an active State Employee, please vote to elect Carey Brown. To find out more about Carey, CLICK HERE. If you are a County Employee, please vote to elect Tracy Smith. To find out more about Tracy, CLICK HERE. Why is this election important? WHAT’S AT STAKE? Last June, the Board of the NJ PERS voted to sue Governor Christie for his failure to make required contributions to our pension. The part of that lawsuit which will determine if the Governor must make the payment for this fiscal year is before the courts right now. And so, management is looking to win the upcoming PERS election and retake a majority on the Board. If they are successful, the Board will likely vote to defund the current lawsuit – and let Christie off the hook. Questions about how to vote? Did you not receive your paper ballot? Contact the help desk at Help+NJPERS@election-america.com or contact your union. Add this button to your website by copying the code below.